Amy Hewitt, PhD has an extensive background and work history in the field of intellectual and developmental disabilities and has worked in various positions over the past 30+ years to improve community inclusion and quality of life for children and adults with disabilities and their families. At the University of Minnesota, she is the director of the Institute on Community Integration. Dr. Hewitt directs several federal and state research, evaluation and demonstration projects in the area of community long-term services and supports for children and adults with intellectual and developmental disabilities, including autism. She currently has research projects that focus on community living, autism, outcome measurement, direct support workforce development, person centered planning/thinking and positive behavior support. Dr. Hewitt has authored and co-authored numerous journal articles, curriculum, technical reports, and she co-authored books entitled, Staff Recruitment, Retention and Training and Critical Issues in Intellectual and Developmental Disabilities: Contemporary Research, Practice and Policy and a soon-to-be-published book called, Community for All: Community Living and Participation for Individuals with Intellectual and Developmental Disabilities. Dr. Hewitt is on the editorial board of Inclusion and an associate editor of Intellectual and Developmental Disabilities, both journals of the AAIDD. She is a past president of the American Association on Intellectual and Developmental Disabilities (AAIDD) and is the vice president of the board of directors for the Association of University Centers on Disabilities, and a past board member of Arc Minnesota. 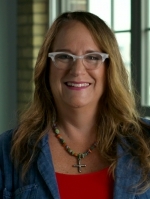 Dr. Hewitt earned a BS in political science and psychology at Indiana University; a Master's degree in social work at Indiana University; and a PhD in social work at the University of Minnesota. A newsletter issue for Direct Support Professionals offering various perspectives on effectively supporting individuals with disabilities who are getting older. A newsletter issue for Direct Support Professionals offering various perspectives on effectively supporting individuals with disabilities as they cope with change. A newsletter issue for Direct Support Professionals offering various perspectives on effectively supporting individuals with disabilities by communicating better with them. A newsletter issue for Direct Support Professionals offering various perspectives on effectively supporting individuals with disabilities with complex needs. A newsletter issue for Direct Support Professionals offering various perspectives on effectively supporting individuals with disabilities as they cope with disaster and its aftermath. A newsletter issue for Direct Support Professionals offering various perspectives on effectively supporting individuals with disabilities by gaining the credentials to do so. A newsletter issue explaining how credentialing Direct Support Professionals (DSPs) can heighten professionalism among DSPs and improve public perceptions of their work. A newsletter issue for Direct Support Professionals offering various perspectives on effectively supporting diverse individuals with disabilities. A newsletter issue for Direct Support Professionals (DSPs) offering various DSP perspectives on effectively supporting individuals with disabilities. A newsletter issue encouraging Direct Support Professionals to think about how to use technology to more effectively support individuals with disabilities. A newsletter issue highlighting the roles Direct Support Professionals play in supporting people with disabilities to find and keep satisfying employment. A newsletter issue for Direct Support Professionals offering various perspectives on effectively - and ethically - supporting individuals with disabilities. A newsletter issue for Direct Support Professionals (DSPs) showing how DSPs in other countries effectively support individuals with disabilities. A newsletter issue for Direct Support Professionals offering various perspectives on effectively supporting individuals through this and future issues of the series. A newsletter issue for Direct Support Professionals showing how building relationships can help them more effectively support individuals with disabilities. A newsletter issue for Direct Support Professionals offering various perspectives on effectively supporting individuals with disabilities as they decide for themselves how to spend their lives. A newsletter issue explaining how Direct Support Professionals can benefit from their NADSP state chapter - and how they can start their own. A newsletter issue for Direct Support Professionals showing how they can cope with stress while still effectively supporting individuals with disabilities. A newsletter issue for Direct Support Professionals showing how training can help them more effectively support individuals with disabilities. A newsletter issue for Direct Support Professionals offering a tribute to John F. Kennedy, Jr. (1960-1999), a great advocate for individuals with disabilities. A curriculum targeting frontline supervisors and managers regarding the use of effective recruitment, retention, and training strategies. Includes Facilitator Guide and Learner Guide. A curriculum helping supervisors and other agency staff find, support, and retain immigrant workers. Includes Facilitator Guide and Learner Guide.